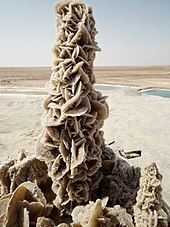 Desert rose is the colloquial name given to rose-like formations of crystal clusters of gypsum or baryte which include abundant sand grains. The 'petals' are crystals flattened on the c crystallographic axis, fanning open in radiating flattened crystal clusters. The rosette crystal habit tends to occur when the crystals form in arid sandy conditions,  such as the evaporation of a shallow salt basin. The crystals form a circular array of flat plates, giving the rock a shape similar to a rose blossom. Gypsum roses usually have better defined, sharper edges than baryte roses. 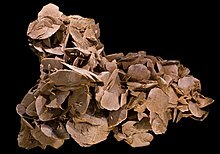 Celestine and other bladed evaporite minerals may also form rosette clusters. They can appear either as a single rose-like bloom or as clusters of blooms, with most sizes ranging from pea sized to 4 inches (10 cm) in diameter. The ambient sand that is incorporated into the crystal structure, or otherwise encrusts the crystals, varies with the local environment. If iron oxides are present, the rosettes take on a rusty tone. 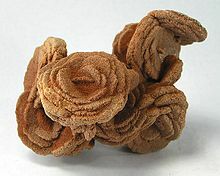 The desert rose may also be known by the names: sand rose, rose rock, selenite rose, gypsum rose and baryte (barite) rose. Rose rocks are found in Tunisia, Libya, Morocco, Algeria, Jordan, Saudi Arabia, Qatar, Egypt, the United Arab Emirates, Spain ( Fuerteventura, Canary Islands; Canet de Mar, Catalonia; La Almarcha, Cuenca), the United States (central Oklahoma; Cochise County, Arizona; Texas), Mexico ( Ciudad Juárez, Chihuahua), Australia and Namibia. ^ a b "ROSE ROCK". Oklahoma Historical Society. ^ "Noble is the Rose Rock Capital of the World". Oklahoma Tourism & Recreation Department. Wikimedia Commons has media related to Desert rose. This article about a specific sulfate mineral is a stub. You can help Wikipedia by expanding it.